A major update is rolling out to S Health, the same that was detailed on stage during the Galaxy S8 unveiling. Moving forward, S Health is now Samsung Health, which is sorta comical considering “S” was simply short for Samsung. I would’ve loved to be a fly on the wall during that super important meeting. Besides a name change, Samsung lists a new feature called Ask an Expert, powered by American Well. 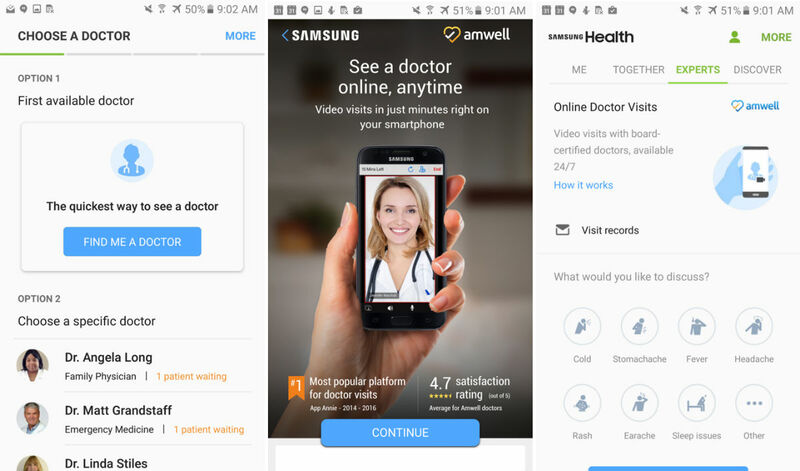 With this, Samsung device owners in the US can receive 24/7 online support from doctors at a time that best suits you. To sum up the experience, you enroll in the program, choose a doctor that works best for you, and then visit the doctor through your smartphone with live video. For all of the details on this, check out AMWELL’s site. Samsung also notes support for six main types of health management under the Accessories section, ability to add a custom pace-setter that matches your own personal goals, plus a variety of bug fixes. Below is the complete changelog, followed by a Play Store link. S Health has changed its name to Samsung Health. Ask an Expert lets you have online doctor visits 24/7 (US only). Six main types of health management device have been added to Accessories (ACCU-CHEK included). You can add a custom pace-setter that matches your goals and performance level.